problems (such as losing sessions when a visitor is directed back from a payment gateway, or avoiding dropped carts due to www or non-www urls or using mirrors/aliases). It also avoids google lowering your ranking because your site will be seen as correctly mapping non-www to www on your site, even for the home page. Redirection is done via 301 (search engine friendly) redirects, and will avoid memory leaks by automatically trying to close the database connection (if it's open already) on VPCart V7/V8 before the redirection is executed. 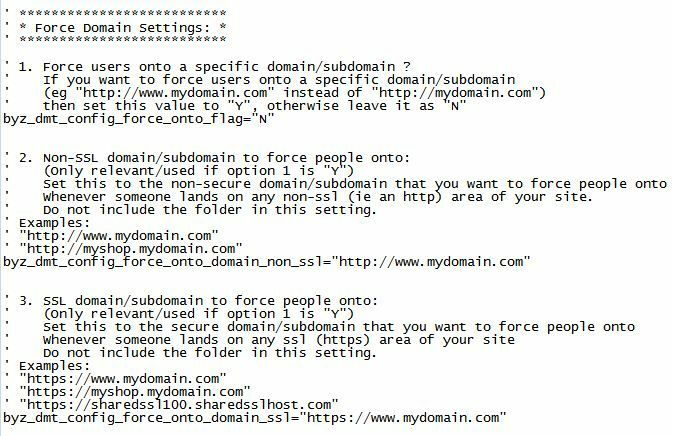 If someone lands on one of your domain aliases, or lands on "http://mydomain.com" instead of "http://www.mydomain.com" then you can setup the config options to automatically transfer them to the relevant domain on the same page that they were originally trying to view. Your home page (eg "http://www.mydomain.com/default.asp") is seen as a different page than your domain root url (eg "http://www.mydomain.com/") by search engines, even though it loads the same asp file. 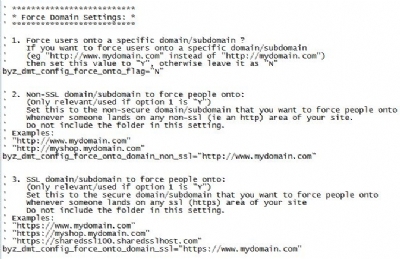 This means that if someone lands on "http://mydomain.com/" (ie non-www) and your server/IIS redirects you to "http://www.mydomain.com/default.asp" then Google will see these as 2 different pages, and it will think that your non-www domain is not being mapped correctly to your www domain. This can lead to Google giving you a lower ranking or even penalising you for duplicate content. BYZ044 avoids this problem as when someone lands on the incorrect domain while on a folder "home" page, it will redirect them to the folder rather than the default.asp url. There's a config option which holds the list of which pages you want to use SSL for; whenever one of those pages is being viewed the addon will automatically redirect the user to the corresponding SSL area (if they're not on it already) for that page, and it'll automatically transfer them back off the SSL area when they land on a non-ssl-listed page. This means that you don't need to change any of the links on your site (either ones you've created in your header/trailer files, or links which are created by vpasp functions) to point to your SSL area as the system will automatically transfer the user when appropriate. If your site visitor is on an ssl page, and they execute a search (eg from the top/side panel keyword search mini-form) from that ssl page, then the domain tool will be able to deal with moving them off ssl automatically on the results page while still retaining their search option/keyword and also without getting a "you're posting from a secure page to a non-secure page" browser warning. Use the BYZ_DMT_CURRENT_DOMAIN function in your gateway config file to ensure that the return url is set to the same domain that the user was originally on so that when they return their session is still active. All of the above are fully configurable/optional, and if using them you can help to dramatically reduce the number of dropped carts that your site gets. The domain "http://mydomain.com" is seen as an entirely different domain to "http://www.mydomain.com" as far as your server/host is concerned, so if people land on one of those domains and then the cart later moves them to the other area (eg via your gateway or from your own links) then the user will lose all their session info. This problem leads to lots of dropped carts, because some people just type in "mydomain.com" into their url line, whereas other people will use "www.mydomain.com". It also leads to Google seeing your site as having duplicate pages which can significantly lower your ranking. This is why this addon is useful for people who have just one domain as well as for people who use domain aliases. This will return the full domain (including the protocol) that is currently being viewed. This might be useful in something like your gateway config file so that you can set your return url to the same domain that the user originally landed on. This will return the main domain (not including the protocol) that is currently being viewed. This might be useful if you want to check which domain people are on and show different headers for different domains etc. This will return the full url, including the protocol and arguments for the page that is currently being viewed. This might be useful if you want to hold the current full url in a variable so that you can return to it later. Useful if you want to display certain elements for certain pages. For example, you could change your header file to only show a certain graphic while on a certain page. Note that this function is case-sensitive; it shows the filename in the same case that the user is browsing on their browser address line. Useful if you want to display certain elements for certain pages. For example, you could change your header file to only show a certain graphic while on a certain page. Note that this function is not case-sensitive; it shows the filename in lower case always. This will return "Y" or "N" depending on whether or not the file which is passed across as "arg_in_filename" is currently being viewed. Note that this always forces lower case, so if using it you should always pass across the filename argument in lower case. Also, you should not supply the relative path or protocol or domain, you should only pass across the asp file name. Useful if you want to display certain elements for certain pages. For example, you could change your header file to only show a certain graphic while on a certain page. 01 04-OCT-2004 Initial version - Big Yellow Zone Domain Tools For VP-ASP. 02 17-NOV-2005 Various extra functions/tools added to return files being run etc. 04 31-MAY-2007 Upgraded BYZ038 (Licensing) module to cater for VP-ASP V6.5. 05 05-OCT-2008 Upgraded BYZ038 from V07 to V09. Upgraded BYZ036 from V02 to V04. 06 27-NOV-2008 Enhanced to cater for shared ssl which has a different directory compared to the corresponding non-ssl area. Changed to ignore case for domain redirection checking. Changed, commented, and rearranged configuration settings. Added more help notes and tips to the readme file. 07 12-DEC-2008 Enhanced to cater for sub-domains redirecting to/from main domains with differing folders (in a similar way to how additional folders on shared ssl is dealt with). 08 26-FEB-2010 Changed installation notes and program files to cater for VPASP V7. Added more files to the default SSL page list (for VPASP V7+ only). Note: If upgrading BYZ044 from a previous version on VPASP 6.5 or below, please note that you need to now have includes for the byz_domaintools_vars_inc.asp file and for the byz_domaintools_inc.asp file, so these includes have been moved (no longer in shop$db.asp) and there are now 2 of them instead of just 1 - see installation notes for more details. 09 06-FEB-2011 Changed redirection to use 301 (search engine friendly) redirection (all versions). Split out the redirection execution into a separate file (all versions). Added database closing to avoid memory leaks (for vpaspv7 only). 10 12-MAR-2012 Added extra config options and logic to redirect to / instead of /default.asp when users land on a folder home page. This avoids search engines from seeing your non-www domain home page as a different page to your www home page and avoids potential duplicate-page errors/problems on Google etc. Created new library function (BYZ_DMT_IS_THIS_SSL() which always returns Y or N). Changed to use the new BYZ038 functions where appropriate. Please Note: You must be using V16 or later of BYZ038 before upgrading to V10 or later of BYZ044. BYZ044 V10 or later will not work with V15 or below of BYZ038. 13 04-SEP-2013 Added an extra config option for a list of ignore files when forcing a move between ssl and non-ssl so that some pages (eg ajax-postings from side panels such as a predictive-search popup) can be done on ssl and/or non-ssl without redirection while other pages still redirect as appropriate. Added extra logic so that when the url is redirected, it also takes with it the relevant form fields (eg for when posting from a search box on a side panel from an ssl page), and added extra config options as a fail-safe to ensure that secure info (eg userid/pwd etc) never gets its form details added to the querystring. Added more pages to the default ssl page-list config option. Added live version/upgrade checks to the documentation documents. Please Note: You must be using V27 or later of BYZ038 before upgrading to V13 or later of BYZ044. BYZ044 V13 or later will not work with V26 or below of BYZ038. Enhanced/changed to cater for VPCart V8. Changed instances of VP-ASP/VPASP to VPCart as VPASP has now been rebranded/renamed.